CONSERVATION MANAGEMENT of EASTERN BLUEBIRDS and NATIVE CAVITY NESTERS USING CAREFULLY MONITORED NEST BOXES — HELPING THEM THRIVE IN VIRGINIA's BLUE RIDGE HIGHLANDS (An All-Volunteer, Self Funded, and Non-Profit Effort). EST. 2008. WHY MONITOR NEST BOXES? IS IT REALLY NECESSARY? WELCOME SIGN: ALL NATIVE CAVITY-NESTERS MAY NEST HERE! THE JOYS OF FLEDGING BLUEBIRDS, TREE SWALLOWS, CHICKADEES … more! HOUSE SPARROW CONTROL. YES, IT NEEDS TO DONE. SUPPLIES: WHAT’S IN MY TRAIL BAG? WANT YOUR OWN BLUEBIRD TRAIL? ← CUTE PHOTOS OF A BLUEBIRD FAMILY EATING TOGETHER….SHARED BY A SUBSCRIBER. 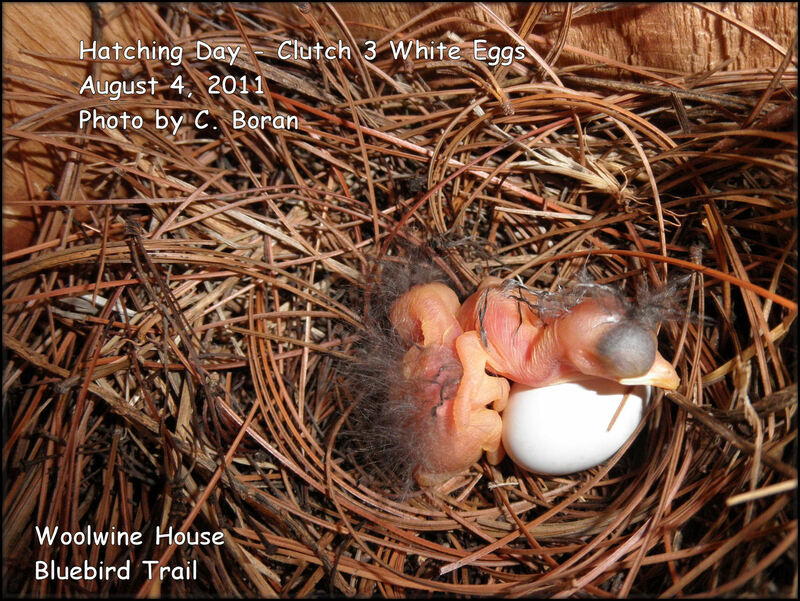 CLUTCH OF 3 WHITE EGGS HATCHED AUGUST 4, 2011 – 5 DAYS LATER THAN EXPECTED. "Hey, bro, while we wait for our other sibling to get outta this shell, let's do the Wiggle-Wiggle dance!" I quickly took these pictures and left them alone. I know the female was close by watching. Already these guys, fresh out of their shells, weak....are HUNGRY. They started to gape while I was there. I am hoping egg #3 hatched OK.
Amazing photos! You are so lucky to have white Bluebird eggs! Hi, Cindy! I agree….not sure if LUCK is the word, but it certainly keeps things interesting. I continue to learn so much year after year! It’s fun to discover something new along my trail. If the news is not so good, I learn from it, try to share it with others, and keep good records and summaries to use in the future, and do all I can so it won’t happen again. Sometimes things happen, no matter how hard we try. That is why monitoring nestboxes is important. I can’t believe I’ve been bluebirding now for 6 years. Before that, I only knew a little about there being a species of a bird called the “bluebird”. See The Trail on Facebook! Great Place For Discussions. Subscribe - Get Newly Pressed Posts Sent To Your Email. Your Privacy is Secure. Do you visit here often? Enter your Email address to subscribe to this site and receive notifications of new posts by Email. Your Email address remains private, and you can unsubscribe at any time. YES, More Bluebirds, Please! Sign Me Up! Music for Nature, Romance, the Great Outdoors, AND THE BLUEBIRDS…Relax & Hear My Playlist While You’re Here. Start At Top To Play All or Click On Any Song. Enjoy! I am a volunteer for the Virginia Bluebird Society and serve as a Certified Virginia Master Naturalist. You may have a VBS County Coordinator who can assist you. Please go to the VBS website for the list of those dedicated people. If your county is not listed, you can leave a message through my CONTACT page form and it will Email me with your inquiry and issue. I will contact/call you back as soon as feasible--usually within the same day. If you live in Virginia and you need to find a licensed wildlife rehabilitator, please see the VA-DGIF website for the list by location. If you find an INJURED bird or baby bird dropped out of a nest (is it naked? ), call a licensed-permitted rehabber IMMEDIATELY for directions what to do. The nest can be searched for and the baby returned to it. Do not attempt to feed or give water to any bird. This will make it sicker. It might be a new fledgling (look for the feathers and tail feathers) that has the parent nearby teaching it to hunt for food. Taking a bird when a parent is near is a bad idea. Doing so will make the bird worse off. If you've established the bird is in danger, with clean hands, put the bird on a a very soft towel in a cardboard box with a lid and take several paper towels and wrap it into a doughnut shape around the bird inside the box to help support it. Put the cardboard lid on top--the darkness will keep it calm. NOTE: It is against federal laws to keep wildlife in your possession--a permit is required. Permited rehabilitators know exactly what is best for the bird you find that needs human assistance for rescue and returned into the wild when it's fully recovered. I AM NOT A LICENSED-PERMITTED WILDLIFE REHABILITATOR and therefore I cannot take in birds. Good luck...and thank you for caring. How It Started–Just Why I Love Them. They Charmed Me! So, you must know this first from me: Bluebirding is extremely rewarding! I had no idea the joys of bluebirds until I saw my first nestbox with both parents feeding their little babies early Spring 2006. This was discovered immediately upon moving into our new home with unpacked boxes crowding the rooms. I heard the sweet cheeping and the brilliant color of Papa Bluebird feeding his young. Soon, Mrs. Bluebird was feeding them as well. Soon I found myself looking out at the nest box very often to watch them. A few days later on a warm spring afternoon, I was wondering why I was not hearing that cheeping anymore. Why was it so quiet back there? I looked out my window at the nest box and, to my horror; I saw a black rat snake dangling out of the nest box's entry hole with lumps in its body. Subsequently the couple tried nesting again; and their second hatchlings died on Day 1 from the excessive 100 degree heat. I figured it out-- they were in a poorly ventilated nest box in afternoon sun -- they baked to death – they had no strength to take in food from their parents after hatching. This was an existing weathered nest box, quite quaint, obviously very old and probably was enjoyed for many years by the former homeowners. It was installed in the back yard close to the house on a 4x4 wood post. I knew something wasn't right that a predator could get to the birds so easily or that baby birds could die from the heat so quickly. Sure, "it's nature", as many say to me; but I have to ask in return: If humans put up a nestbox to invite our resident birds to use them, is that not playing a practical joke on them if we don't give them a chance to "succeed" in them without the use of predator guards? -- in other words, enticing them to use a nest box for them to use but then tell them “Here, raise your family here but NEST AT YOUR OWN RISK.” OK, a bit of joking aside, it's a point and one I have thought about in great length. There has to be a balance here with nature, of course. A natural cavity is pure nature--if a bluebird nests naturally in what nature leaves for them, and they fail because they are taken by another natural predator--that is truly nature and who am I to intervene? My curiosity and disappointment drew me to these thoughts to myself, "I have to find out how to change this! I want to see bluebirds raise a family! Can I help them succeed when I install something I make for them--a nest box from a workshop?" Obviously, after those two failures of watching these bluebirds lose their families, I became bound and determined to troubleshoot this and get a proper nest box installed for them in the right habitat to use in the future that would give them a safer place to nest and successfully bring up a family—call out to their young that it was time to leave the box and come into the world. Once I witnessed for myself maiden flights (called fledging) of healthy baby bluebirds, I became hooked on this worthy hobby, if you want to call it that -- a cause and new ambition I wanted to fulfill to help my own local bluebirds. Soon after that, I learned in my research why the numbers of the three species of bluebirds in North America declined drastically in the past century and all the challenges they still face -- even today. This is how the Woolwine House Bluebird Trail commenced -- and with the gracious help from my neighbor a few miles down my road, Carl, who worked with me to plan and build the nest boxes I wanted for my new bluebird trail in his workshop with 14 nest boxes. He graciously assisted me in the installation process, using his tools, and with annual repairs, as needed. 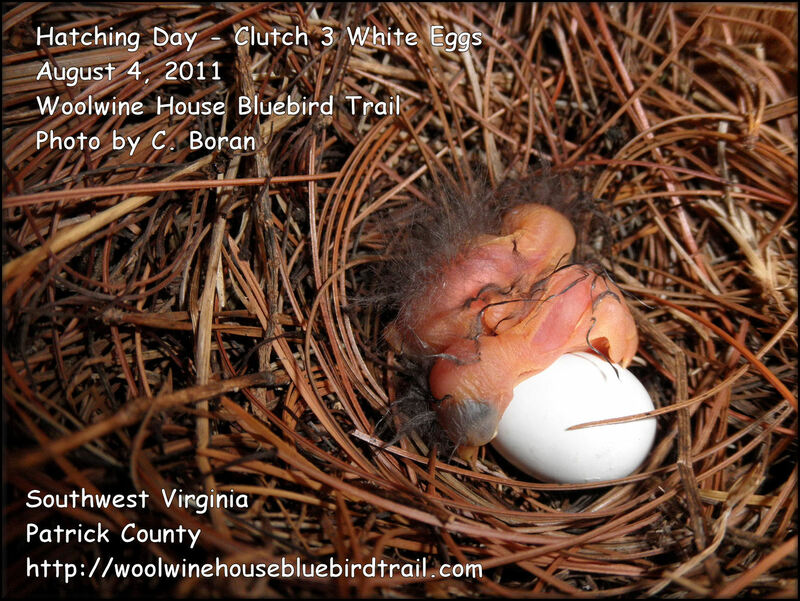 Today, I am happy to say I will be monitoring and keeping accurate records of 33 nest boxes on my bluebird trail for Year 2013! I owe many thanks to all the property owners granting me permission to install and access these nest boxes on their private properties. These nest boxes are designs that give excellent ventilation on those very hot days, good floor drainage to help keep nests dry, the right amount of space inside the box for the nestlings as they develop and grow, easily opened for safe observation, troubleshooting issues and problems, cleaning out the soiled nests yet secure when closed, and a sloped and kerfed roof with a large overhang that repels rainwater. The bluebird population numbers have come back in the past decade thanks to the man-made nest box projects across North America. Bluebird scientists, ornithologists, and experts all agree -- bluebirds will always be in need of human assistance to continue to thrive in the 21st Century. Too many problems can take place in putting up a nestbox and then leaving it unattended—uncared for—unmonitored—unmaintained—unrepaired—without predator guards—and more. We do not want the non-native House Sparrow taking over these boxes. If wasps occupy a nest box, birds cannot. Monitoring nest boxes is a must if we want to help bluebirds and other native cavity-nesting birds. There are just too many issues that will go against them succeeding in fledging young. I also learned that an average of about 50% of fledged baby bluebirds live to be a year old. If you ask me, we cannot have too many bluebirds. This site brings you closer to my bluebird trail. Come take a walk around here and see what's happening! I am open to new ideas and suggestions--feel free to offer your comments. Come to the Facebook page and see the discussions. Ask questions. This is my passion -- I love doing this. However, I do more than bluebirding. My other interests include: Photography, Hummingbirds, Antiquing and Things Vintage, Tibetan Terriers, Horses, Steam Trains, Music Appreciation, Nature and Naturalist Activities, and Weather and Wildlife Watching -- of course, keeping the Facebook page and this website up to date. There is never time to get bored. You Tube-More Baby Bluebirds In A Nestbox! The Eastern Bluebird and the Tree Swallow – Beautiful Video The Tree Swallow is one of my favorite native cavity nesting bird that uses my trail’s nesting boxes. Search This Site – Type in Your Keywords by Topic. Top Liked Articles — Mouse Over Images For Titles. Comments Welcomed! All Comments Are Approved Prior to Posting. 2017 SPRING TRAIL KICKOFF. NESTBOX CHECKS ON MARCH 9 and 12, 2017. NESTBOX MONITORING PROTOCOL ON THE TRAIL – LEARNING and EDUCATION TO OTHERS IS KEY ON THIS WEBSITE. Thanks WordPress! The Fight Against Spammers Continue! Sharing the pleasures of birding. CONSERVATION MANAGEMENT of EASTERN BLUEBIRDS and NATIVE CAVITY NESTERS USING CAREFULLY MONITORED NEST BOXES -- HELPING THEM THRIVE IN VIRGINIA's BLUE RIDGE HIGHLANDS (An All-Volunteer, Self Funded, and Non-Profit Effort). EST. 2008.